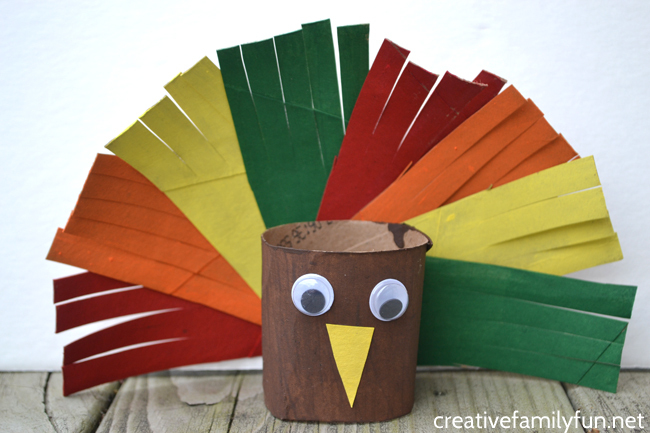 Out of the dozens of cardboard tube crafts we’ve made over the years, we’ve never made a turkey. Go figure. 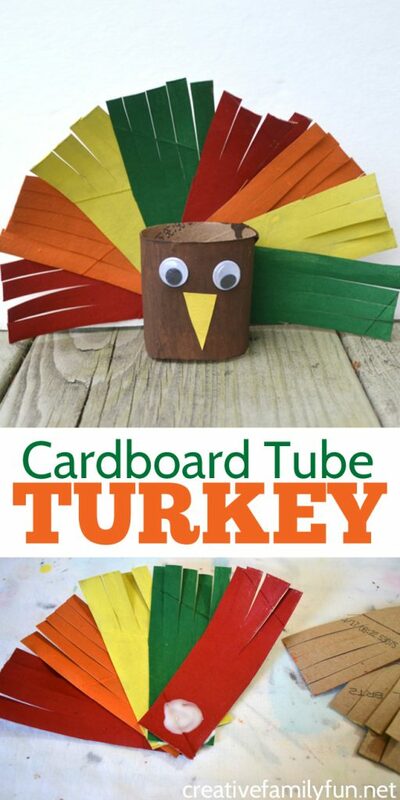 So, this was the year to correct things (and use of that supply of cardboard tubes we’ve accumulated) and make a cute and very colorful Cardboard Tube Turkey Craft. Let’s grab some supplies and get crafting! 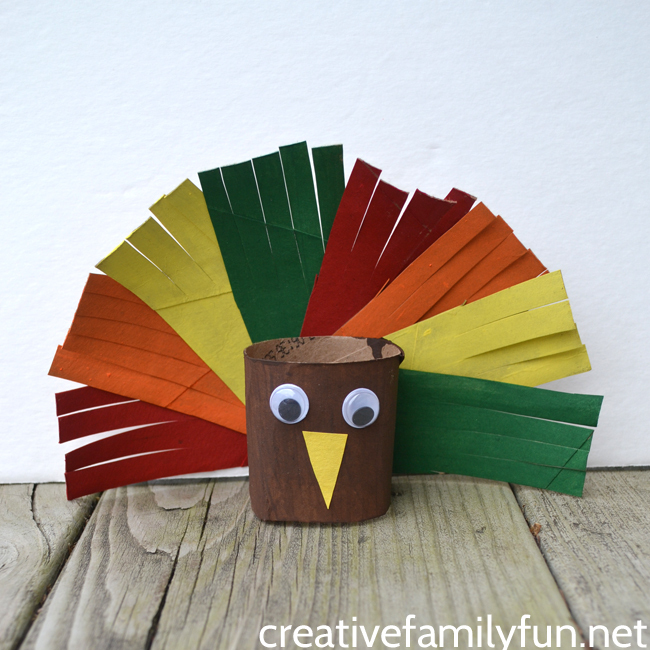 And, once you’re done with your turkey, check out all of our Thanksgiving Crafts for Kids for more holiday fun with your kids. To start, we need to cut up our cardboard tubes. Cut one tube in half. We’ll only use one of the halves for our turkey, so set the extra half aside. Cut the other cardboard tube lengthwise into four different sections. Paint your half tube brown and your lengthwise sections in red, orange, yellow, and green. 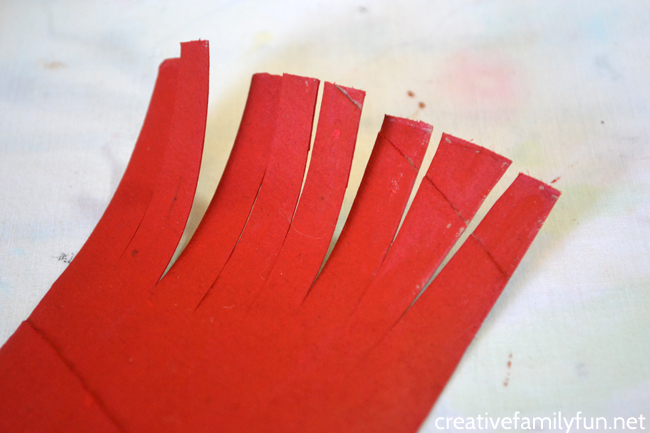 After your paint is dry, cut fringes in the top of each color section. Then, cut each of the sections in half lengthwise. You’ll have eight different fringed pieces for your tail. 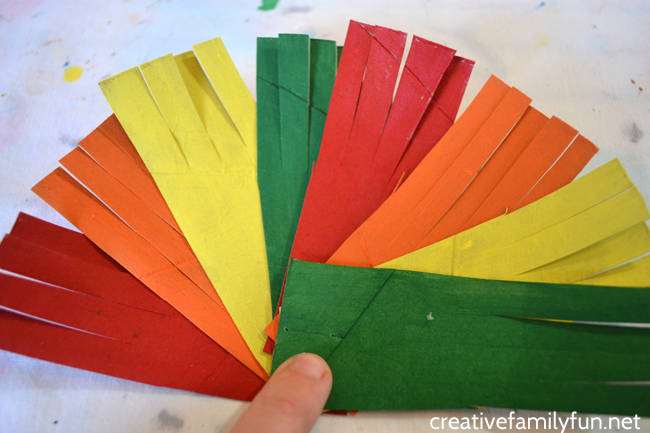 Alternate the colors and arrange your fringed section into a fan-shape. You’ll want it to be in the shape of a half circle. Glue your tail pieces together. Start with the first piece, and use a quarter-size spot of glue to glue each piece down. Glue piece by piece until you have your fan shape complete. Hold tight for awhile to let the glue dry. Then, take a clothespin (or any type of clip) and clip the glued section to hold it tight while the glue dries. It can take awhile for the glue to dry since this is such a thick piece. While you’re waiting for your tail to dry, complete the turkey’s face. Glue two googly eyes and a small triangle of yellow for the beak. Finally, take your tail (which will be a bit heavy) and glue it to the back of your turkey. Use your clothespin to help hold the two pieces together until they dry. Note: If you would like to avoid the drying time, you can use a hot-glue gun for this project. It will dry a lot faster and you won’t need to use the clothespin as a clamp. If your kids are old enough to use a hot-glue gun, I would use this instead of the white glue to cut back on waiting times. 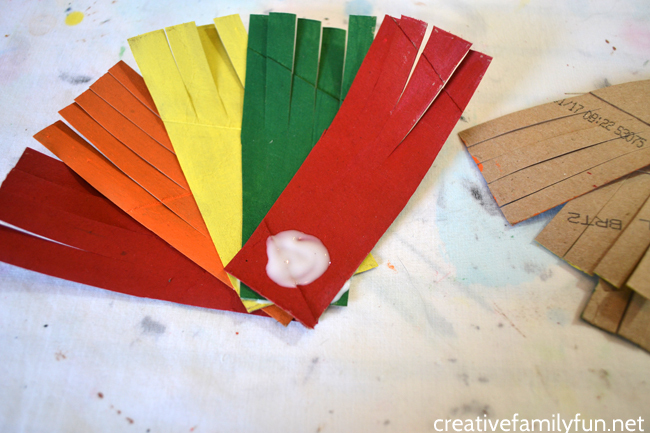 Once everything is dry, your super-cute and colorful turkey craft is ready for display. 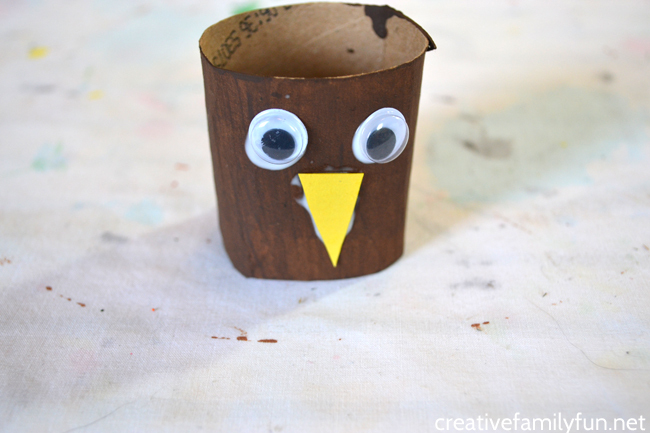 If you enjoyed this Cardboard Tube Turkey Craft, the above photo is perfect for sharing on Facebook or you can save the photo below on Pinterest. If you’re looking for easy crafts, I love the limited addition Thanksgiving Box from Green Kid Crafts. It comes with all the supplies and instructions you need to make some cute Thanksgiving Crafts. 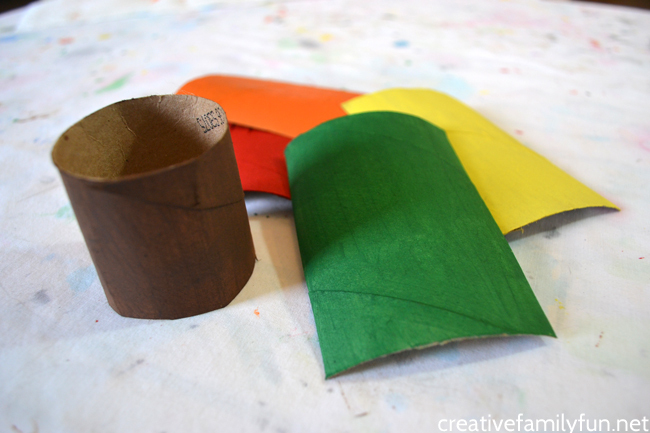 We’re big fans of Green Kid Crafts boxes. They’re fun, easy, and contain only natural and sustainable materials. And, if you’re not interested in their Thanksgiving Box, there are plenty of other art and STEM boxes (including a monthly subscription) to choose from. Find the Thanksgiving Box here. Check out all the other boxes here.